If you ask a group of high schoolers in Italy what is the most local thing to do in Rome, I am pretty sure at least one will say that it is eating a kebab. I am fully aware that a kebab here is completely different from ones in, let’s say, Istanbul, but it is still hands-down my favorite street food for lunch. Kebab is a pretty straightforward place, as you can guess from the name. 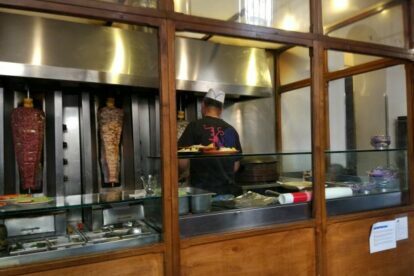 It’s one of the few quality spots for the Turkish wonder, offering meat, chicken and, depending on the day, either veggies or fish kebab. My personal favorite is getting a mix of the first two, but the fish is definitely unique. In addition to takeaway, the place also offers table service, with more excellent, refined food and daily specials which are always great. 1. If you are going to try eating it while walking, you will have a bad time. 2. Peel the tinfoil circularly around the roll and be sure to leave enough room for a bite, being careful not to tear away too much foil too soon. 3. Small lateral bites are better than trying to eat it all in a few central bites. 4. The end bit is impossible to eat without getting your hands dirty but it is also the best part so just wing it.